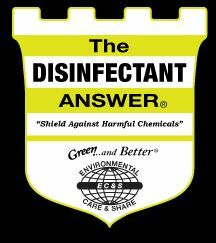 The Disinfectant Answer® is a breakthrough in the world of sanitizing, sterilizing and disinfecting! The Disinfectant Answer® - works “Electrically” and NOT Chemically. The Disinfectant Answer® - produces environments so unfriendly to bacteria, fungus, mold, yeast, and even some viruses, that they are killed or made inactive within minutes or even seconds of application! The Disinfectant Answer® - is a means of disinfecting and sanitizing all surfaces including, but not limited to, walls and floors, medical and laboratory facilities and equipment, schools, sports and locker room areas, animal facilities, and food processing equipment.